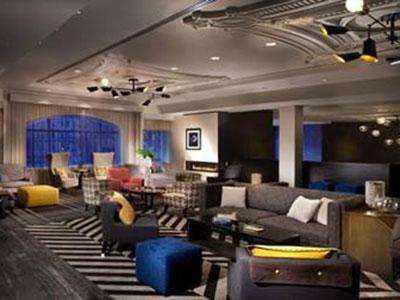 BOSTON—Hotel Commonwealth has debut its redesigned lobby, which is part of a $50-million makeover. The new lobby concept reflects the personality of Kenmore Square and its urban clientele with a crisp, modern aesthetic and a pop of classic patterns, according to the property. The renovation represents the second stage in an overall expansion for Hotel Commonwealth, which will be completed in November 2015 and features the addition of 96 guestrooms; a designated Fenway Park Suite overlooking the stadium’s Green Monster; two additional suites with Fenway-facing balconies; 6,000 sq. ft. of meeting space; and 2,000 sq. ft. of outdoor space overlooking Fenway Park. The four-month, $1-million lobby redesign, courtesy of New York’s dash design, transformed Hotel Commonwealth’s former traditional lobby space into an elegant yet comfortable gathering place, according to the hotel. Classic patterns such as houndstooth and plaids were made current by altering scale and layering texture in carpets and upholstery, creating an unexpected contemporary prep style. Trading in the traditional check-in desk, Hotel Commonwealth opted for two free-floating pods. At check-in, guests will also have the option to purchase snack boxes with hand-selected, locally sourced items from Olives & Grace, an artisan shop in Boston. Additionally, NINE Dot ARTS, an art consulting firm based in Denver, curated works from local artists that play off of local themes, including a wall featuring artworks of Boston Terriers. Working with architect Group One Partners and dash design, Hotel Commonwealth’s expansion will extend the existing building over the parking lot at the rear of the hotel facing Fenway Park. An enclosed footbridge connects the current and new building.